A Phuket Wedding is an absolute treat for the senses. And especially so at Pullman Phuket Arcadia Naithon Beach. With inspiring scenery, fine cuisine and 5 star service, this award winning Phuket resort is the perfect place to say ‘I Do’. Showcasing a collection of venues as unique as your love story. Celebrate your big day in a meaningful and beautiful way. Set along the pristine coastline of Naithon Beach. One of the best beaches on the west coast of Phuket. This hidden gem offers a variety of venues and packages to host a wedding party of any size. Leave the stress of wedding planning at home. 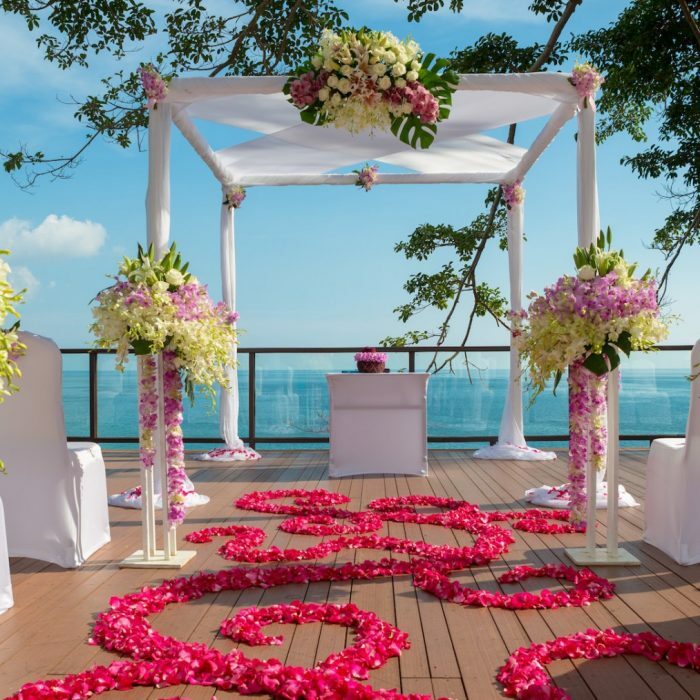 Create your fairy tale Phuket wedding with the team at Pullman. Elevated on the headland overlooking the crystal waters of the Andaman Sea. Wed in a romantic beachfront location. Beyond anything you have ever dreamed or imagined. An outdoor wedding at this Phuket Resort lends a natural backdrop of ocean views. 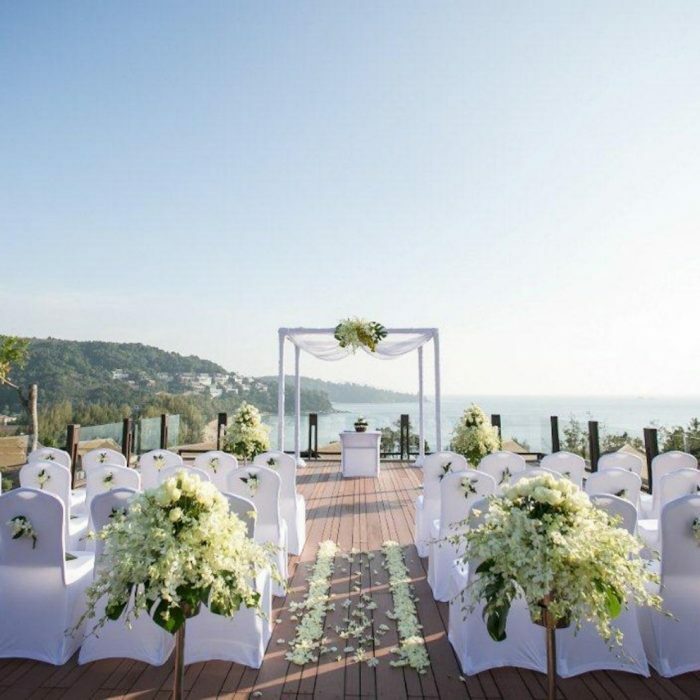 Walk down the aisle to your something blue with a wedding in Phuket. Your wedding day is one of the most special times in your life. A day you will remember forever. So, you deserve the best place to start your happily ever. You will be spoilt for choice with a range of wedding venues to suit any size or style. Whether you want a small ceremony or a big Phuket wedding. You will fall in love with one of the venues at Pullman. Offering a picture-perfect setting, this Phuket resort has witnessed many happy couples tying the knot. The most desired spot for a wedding is the Banyan Tree Deck. This open-air venue is a private terrace with endless ocean views. 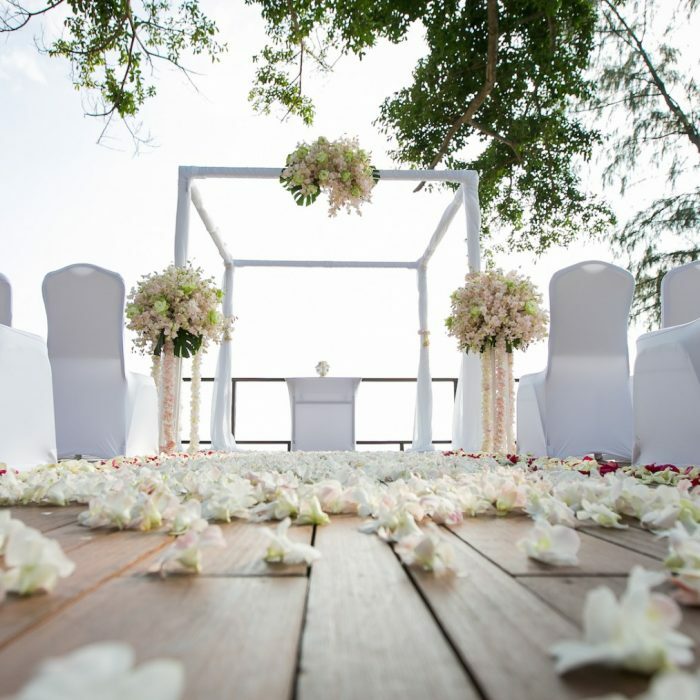 Imagine exchanging your vows in front of the natural beauty of the Andaman Sea. For an indoor, more grand affair. The stylish Ballroom is the perfect space. Seating up to 250 guests. The ballroom is finished with high ceilings and neutral tones. An elegant canvas you can theme just the way you like. Forget the stress of wedding planning. From the moment you book your wedding in Phuket. The team at Pullman will take care of every detail. Large or small. A destination wedding can be a little overwhelming when you don’t know the local vendors. So, the team at Pullman Phuket have created a range of wedding packages to help plan your wedding in Phuket. They will also help source and suggest any vendors to meet your needs. Connect with the local culture and marry in the traditional Thai way. The Thai Wedding Package is complete with a Monk or Thai Pouring Ceremony. And a 2-hour set of live Thai instrumental music by a single player. A Western Wedding Package offers a contemporary look you can tailor to your wedding style, music and theme. Take your wedding in Phuket to the next level with a champagne celebration. The Veuve Clicquot Package has been specially designed by Pullman to ensure you have a glass of premium bubbles in your hand for every moment of your Phuket wedding. Each package is inclusive of professional hair and makeup for the bride. A photographer to snap your memories. Tailor-made florals and full venue decorations. Leading up to your wedding can be a busy time. So get pampered with a romantic spa treatment for two. The best way to relax and ease tension before your big day. Or wake up as Mr & Mrs with a post wedding brunch in your room. A wedding gift from Pullman Phuket. 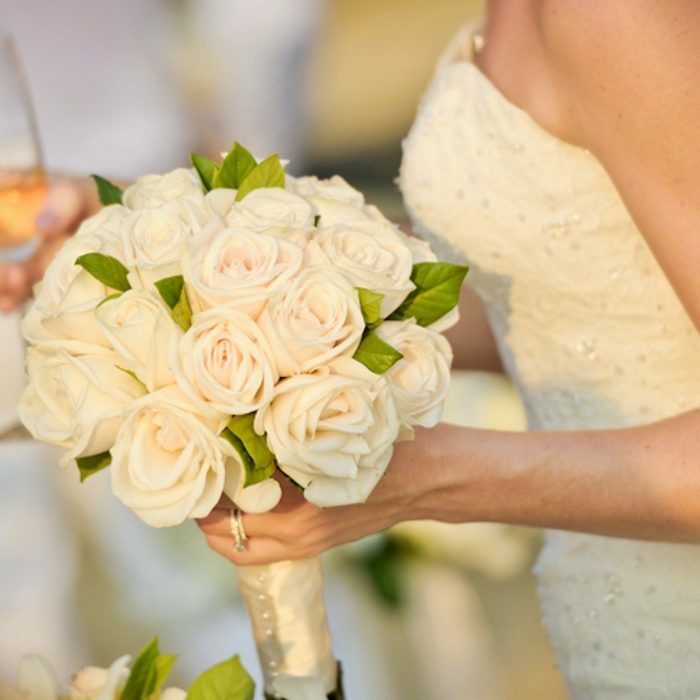 A dedicated wedding specialist will assist you every step of the way. Whether you would like a small intimate gathering or a grand reception. Pullman Phuket Arcadia Naithon Beach has the venue and package to suit. The best part about tying the knot in the tropics. You can start your honeymoon the minute you say ‘I Do’. Boasting 270 modern rooms and 7 pool villas. Each exuding both style and comfort in a tropical seascape. Having your friends and family close by to celebrate is important to you. So it is important to us. When you book your wedding at Pullman Phuket resort, your guests get access to special accommodation rates for their stay. There is nothing like having those you cherish most around you leading up to your wedding day. A Pool Villa is fit for bridal bliss. Begin your honeymoon in Phuket with a few nights in an ocean view Pool Villa. Savour the sun and sand with an extra level of surprise and delight. Chilled champagne and rose petal milk baths await you. Considered some of the most serene Phuket Pool Villas for couples. Start your married life in true luxury style. Enjoy leisurely breakfast in bed, whilst you overlook the ocean vista of the Andaman Sea. Create a private playground of your own, the only thing to disturb you will be the whisper of the sea breeze. Beach chic design, outdoor dining area and a private infinity pool are all paired with luxurious amenities and service. Soak up the sun during the day and star gaze at night. It’s the perfect harmony of nature and man-made beauty. A honeymoon suite you and your groom deserve. Nothing says ‘WOW’ like ocean views, extraordinary settings and irresistible cuisine. Host your dream wedding in Phuket for all of this and so much more.